This entry was posted in Life and tagged Dog in Backpack, dogs. Bookmark the permalink. I demand equality for cats! 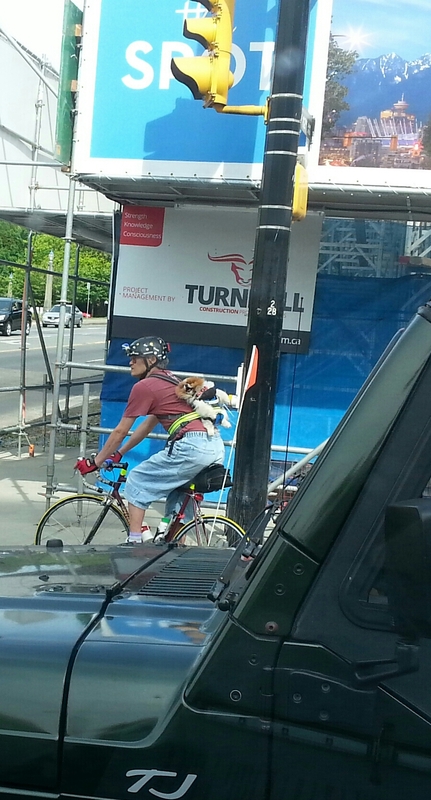 Is that a ratchet strap securing dog to owner? I think dogs prefer travelling by car with their head poking out of the window. Good idea, bad execution. I can see travel accessory makers making a killing out of this one. As ridiculous as that image was, I’m far more annoyed at all the people — RV’ers among them — who insist on driving with dogs on their lap…. Grrrrr. How driver lap dogs aren’t considered “distracted driving” is beyond me. A few years ago I looked after my neighbour’s Mastiff and Staffordshire Terrier. Driving my boxer and 2 neighbour dogs for a run in the woods, the Mastiff decided to get on my lap. Holy crap! Let me assure you – driving with 100 lbs. of dog on your lap isn’t recommended.Suffice to say measures were taken to insure it never happened again. I’m so with you. When we still had our Bulldog he was never allowed, and that didn’t mean we didn’t love him!!!!! The thing is, that I see that more in large town than in rural U.S.A.. I’d expect it maybe in backwater joints, but there’s too much traffic in big cities — even if it WERE a good thing, which it isn’t. Write ‘em all a ticket!